Ayurveda recommends a simple, practical and effective method of drinking water in its most holistic way - drinking water from a copper vessel. To make copper water, pour water in the copper vessel and leave it overnight. When water is kept for a specific time period in the copper vessel, it kills the undesirable bacteria and viruses and the resultant water gets charged with the health benefitting qualities of the copper. Drink it as soon as you get up in the morning. You can also use your copper cup to drink water from it at all times. It's recommended to drink the water at room temperature. The copper vessel should not be stored in fridge. Copper darkens naturally over a period of time. The copper vessel and requires cleaning from time to time. Use lemon juice or tamarind to rub the utensils. Leave it for few minutes and wash with water. 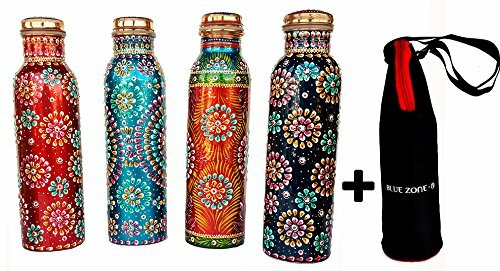 A handy Hand Painted Embossed Art work designed bottle 100% leak proof, can be carried anywhere.LONG LASTING & LEAK PROOF: New and Improved Cap is made to be screwed on and is provided with a silicone washer to give you a long and leak proof use. It is water tight with a seal that keeps the water out even when the bottle is upside down. For Pure Copper Items: Like a fine wine, our products get Better with age. INCREASES WATER CONSUMPTION, REDUCES WEIGHT & JOINT PAIN: The water tastes absolutely amazing if stored overnight and it makes you drink more, and more water which is definitely healthy and this in turn helps In weight loss and reduces join pain. Comes with Guide Book of Rastogi Handicrafts Genuine Product , Benefit & Care tips --- MAKES YOU LOOK YOUNGER & HAVE HEALTHY SKIN: The copper bottle water is Anti-Aging. It helps reduce fine lines, wrinkles, and patchy skin. Drinking water from copper pot can thus help you look younger and fitter. Copper melts away the excess fat. Copper water helps in maintaining digestive health, reduces fat and alleviates excess obesity. Traditional Pure Copper Drink ware Bottle Utensils for Indian Ayurveda Health Benefits. If you have any questions about this product by Rastogi Handicrafts, contact us by completing and submitting the form below. If you are looking for a specif part number, please include it with your message.